WX4NHC, the Amateur Radio station at the National Hurricane Center in Miami, Florida, was activated on Saturday, December 1, for SKYWARN Recognition Day, a nationwide event. Julio Ripoll, WD4R, Assistant Coordinator for the station, said "This was an excellent on-the-air event to practice our radio skills and exchange basic weather data over ham radio between NWS forecast offices and volunteer SKYWARN spotters. We tested our equipment, antennas, computers and several modes of communications that are used to gather surface eye witness reports during severe weather events including, of course, hurricanes." Ripoll said that "this was also a good opportunity to train new operators on equipment and procedures, and interface with NWS staff that may not be familiar with the capabilities of Amateur Radio communications." "Even though HF propagation was poor from our location in south Florida, WX4NHC operators were able to make a total of 122 contacts -- 70 on HF, VHF and UHF frequencies, and 52 on EchoLink and IRLP," reported Ripoll. "We made direct contact with 24 NWS offices nationwide. The farthest station contacted was in Estonia where it was -1° C with light snow. The coldest weather report received was 18° F from Turner, Maine. The warmest weather report received was 82° F from Brownsville, Texas. The most unique report was "Volcanic Haze" from Honolulu, Hawaii." Ripoll offered special thanks to the VoIP Hurricane Net team operating from NWS Taunton, Massachusetts, for sponsoring the net on EchoLink/IRLP. The old adage that "a disaster is not the time to be exchanging business cards" was validated. In areas where strong relationships had been previously developed with our served agencies (Red Cross, Connecticut Department of Emergency Management and Homeland Security, and municipal governments), requests for Amateur Radio assistance in shelters and at EOCs were quickly and effectively handled at the local level. In those areas where ARES/SKYWARN officials exercised active/strong leadership and were proactive in offering and providing Amateur Radio support, there were a lot of useful and productive assignments available to our volunteers. The five regional DECs and the SKYWARN DEC (or their designated representatives) participated in statewide SEC nets conducted every two hours. The SEC net gave me a good feel for where things were going well and where they were not. Section Manager Doane was an active participant and helped me to identify and address any issues in our response. VHF/UHF frequencies (both repeater and simplex) provided the primary platform for our disaster response and emergency communications needs. 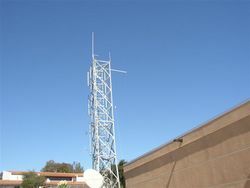 During the widespread power outages, many of our repeater systems shifted to emergency power and continued to function. Repeater owners and control operators did an extraordinary job of keeping us on the air. The KB1AEV linked system in particular remained viable and provided coverage for approximately 80% of the state. Many of the facilities where we rendered assistance would not easily accommodate deployment of HF antennas. A significant number of our volunteers are affiliated with both ARES/SKYWARN and the Red Cross (and to some extent, other volunteer groups who provide disaster support). Depending on the nature of the incident, volunteers may choose to assist one of the other non-governmental organizations (NGOs) whom they support rather than ARES/SKYWARN. This "double counting" of resources creates a shortfall in the numbers of operators expected to be available to help. Typhoon Bopha (local name Pablo), a Category 5 super storm, hit the Philippines on December 3 uprooting trees, downing power lines, sparking landslides and driving 40,000 people to head for shelters. It was the strongest of about 20 typhoons to affect the country this year with its heavy rain and wind gusting up to 210 km/h as it came ashore at Mindanao. It was the strongest typhoon to ever hit the southern island. More than 600 died. The Philippine Amateur Radio Association (PARA) had its ham emergency radio operations (HERO) program working when the typhoon struck. PARA used all available means of communication including HF radio (7.095 MHz), VHF radio (144.740 MHz), the Internet and social media such as Facebook, e-mail, and EchoLink to monitor the situation and give updates to all concerned as necessary. RADNET 5, a local club of Amateur Radio operators in Tacloban City, provided the city with vital communications links and was in constant coordination with the City Disaster Risk Reduction Management Council (CDRRMC). 5700 families were evacuated from Saint Bernard. RADNET 5 also assisted the Red Cross in Tacloban and Saint Bernard. The City Government of Tacloban City used the Tacloban Convention Center as one of its evacuation points. The eighth Global Amateur Radio Emergency Communications Conference, GAREC-2012, took place in Port Dickson, Malaysia, November 12-14, hosted by the Malaysian Amateur Radio Transmitters Society and was attended by 17 delegates from nine countries. The theme of the conference was "One world, One commitment." In 2005, the first Global Amateur Radio Emergency Communications (GAREC) Conference was organized on the initiative of Seppo Sisatto, OH1VR, in Tampere, Finland. Following the success of this event and the increased interest in international and regional cooperation on the function of emergency communications, GAREC conferences were established as annual events. For the Malaysia conference last month, presentations were received on the mobile emergency weather system, which provides a means for citizens to assist authorities with weather reports using simple equipment and training, augmented by the amateur service. The status of the Amateur Radio Emergency Service provisions in Finland, Hong Kong, Indonesia, Germany and Switzerland was discussed, which highlighted the differences and similarities in approaches to emergency planning by the respective countries, directed to meeting the needs of their peoples. The Swiss delegation presented their procedure for a special net control protocol, which provided more efficient message handling when the volume of messages increases beyond the needs of a simple net. The conferees considered the common issues facing Amateur Radio emergency communicators, and recognized that while solutions may not be easy to find, sharing the problems and allowing individual countries to realize that they were not alone provides valuable support to the global Amateur Radio emergency and disaster relief community. Conferees participated in two exercises, the first a directed exercise where they were asked to work together as a team, providing emergency communications for a fictional country and event. This encouraged the delegates to consider what their ideal network and licensing environment would look like as well as enhance interpersonal relationships helping them to work together more efficiently in the future. The IARU HF Emergency Operating Procedure was reviewed following the experience of use in GlobalSET and national exercises. A number of opportunities were identified to improve the procedure and these will be developed by the delegates for presentation to the IARU Regional Emergency Coordinators (EMCOR). The titles of "GAREC" and the "Global Centre of Emergency Frequencies" (CoA frequencies) can be misinterpreted as only referring to "Global" emergencies, concluded the conferees. This is not the case, they said. "The Conference and CoA frequencies are available for all emergency communicators around the world to share their knowledge to assist their colleagues who are having problems themselves." There was a discussion on how GAREC and emergency communications should be branded to allow more exposure to served agencies and the public we also serve: "All emergency communications groups are encouraged to share information on all emergencies they are asked to assist with so that our public profile is raised and understanding of our service improved." It was discovered that four countries were independently looking at the issue of monitoring the CoA frequencies to allow the alert to be raised for a disaster or emergency in an automatic manner: "It would obviously be better for those countries to collaborate on establishing a standard solution. The continuation of GAREC as a forum to share ideas and plans may prevent duplicate efforts in the future." There was increased understanding of the restrictions placed on radio amateurs in different countries in the context of emergency response. The delegates suggested that future conferences seek to involve partners in emergency response such as IFRC and ITU to ensure that the most value is gained from the memoranda of understanding that exist between those organizations and the Amateur Radio community. The next GAREC will be held in Zurich, Switzerland, June 25-27, 2013 and all groups and organizations are invited to attend. Future conference venues have been identified as Huntsville, Alabama, United States in 2014; and Tampere, Finland in 2015. The conferees thanked their hosts, the Malaysian Amateur Radio Transmitters Society, and the people of Malaysia. Documents of GAREC-2012 can be found here. For each conference, an organizing committee works together with a local host, and IARU representatives participate in the event. In its 2009 meeting in Christchurch, New Zealand, the IARU Administrative Council has now defined the relationship between GAREC and IARU, by adopting the following recommendations contained in the Statement of the GAREC-2009 Conference: "GAREC 2009 recommends that GAREC conferences should continue to be held in locations throughout the world to the extent possible and should maintain the character of GAREC as an informal meeting among representatives of IARU member societies and of Amateur Radio Emergency Communications Groups within or outside of the respective National IARU Member Society, serving as a forum for the exchange of experience and as an advisory body for the work on emergency communications of the IARU." No, it wasn't the misdirection of a national holiday, but rather the opportunity to focus on digital messaging modes that motivated Clark County (Washington) ARES/RACES members to venture out for three hours on a dark and stormy evening, November 19. A weekday evening was selected this time around to allow members who are not normally available for weekday and/or weekend exercises to participate. The four Santa Barbara (California) County ARES units were activated on November 15 to assist the county's public health department in a state-wide emergency response exercise. As it turned out, the amateurs saved the day when the participating agencies were unable to deliver messages through the new WebEOC computer system. The scenario was a major earthquake and each county health department was to respond as though the disaster were local. In Santa Barbara County, players included all hospitals, skilled nursing facilities, the American Red Cross, Direct Relief International, and retirement communities, law enforcement, public works, etc. The County Office of Emergency Management staff had been training local agencies on the Web EOC computer program for several months. This exercise was to be a real-time test of the system, recently installed in the new Emergency Operations Center (EOC). ARES members reported to five local hospitals to establish backup communications with the Public Health Department's Operations Center (DOC) and the County EOC. They were also asked to respond to a medical field treatment center in Santa Barbara, about 15 miles from the DOC. Because three of the hospitals are separated from Santa Barbara and the DOC by a 4,000'-high mountain range, a 2-meter repeater on the ridgeline was used for county-wide voice communications. Each of the four areas established nets on their local repeaters and on 2-meter simplex frequencies to communicate between field units, EOCs, hospitals, and the DOC. Within an hour of the exercise start, it was apparent traffic flow on the WebEOC system was in trouble. ARES communicators at hospitals and city EOCs were sending queries to the County EOC about messages that had not been answered and information expected to arrive had not been received via WebEOC. Fortunately, flow of traffic to, from, and between the hospitals, EOC, and DOC on the ARES networks was seamless and important information, such as conference call phone numbers and codes, allowed the exercise to continue as planned. A Battalion Chief who is the Communications Coordinator of the Lompoc Fire Department said, "ARES was about the only communications that worked." The ARES operator at the EOC also checked in to the state and region nets on 40 meters. In addition to voice communications backup, the Public Health Department requested the Santa Barbara ARES unit to provide Slow Scan TV from a field treatment site they had set up in Santa Barbara, about 15 miles away, to the DOC. A 224 MHz repeater on the mountain was used to send the images, which were received in both the radio room at the DOC and in the operations center so staff managing the emergency could see "victims" arriving, doctors providing triage and care, and transportation. The Emergency Preparedness Program Administrator was extremely pleased with the abilities of Amateur Radio to be flexible and respond to the needs of the operations center staff as they occurred. The staff specifically requests SSTV whenever they feel it will be useful to them. Nineteen ARES members participated, led by Lou Dartanner, N6ZKJ, District Emergency Coordinator; Bruce Gordon, N6OLT, Santa Barbara EC; Ray Lischka, W9EC, Lompoc EC; Jim Gilbert, AK6JG, Santa Ynez EC; and Dennis Daniel, KM6DF, Santa Maria EC. The Uintah County (Utah) ARES group was called by the National Weather Service's Grand Junction (Colorado) forecast office on Saturday, August 11, to work in a SKYWARN capacity for expected severe weather. Lamond Harrison, WX7L, Uintah County EC, sent alerting texts and e-mails, and put out a call on the radio to ARES/SKYWARN members to be prepared. Harrison reports: "At about 1:30 PM we were activated. The NWS requested that we have people stationed at multiple points on the mountain north of Vernal to report the received weather. The computer models were predicting heavy rain with hail up to 1.25 inches in diameter and high winds. So we grabbed our equipment and off we went." Uintah County is located in the northeastern corner of Utah. It's larger than Delaware and has a population of about 33,000. Dagget County is north of the county next to Wyoming, and Moffat County, Colorado, is to the east. The NWS office in Grand Junction is located 140 miles southeast of Vernal, Utah. Because of the mountains in the area, we are in a Doppler radar "black hole," said Harrison. "The bottom of the radar image over Uintah County is about 20,000 feet high. Vernal's elevation is 5230 feet. So, the radar does not come close to seeing what is happening on the ground. The southern part of Uintah County is high mountain desert. Only Sage brush, cactus, and a few clumps of grass grow there. Flash flooding is a constant danger. So having the radar working properly is critical for the highway over the mountains and the many roads and energy workers in the desert. Because the Doppler radar image is only looking at the tops of the storm clouds the NWS has written computer models to let them know what is actually happening on the ground. They want them perfect. That is why they called us, Harrison said. Our staff and I are very grateful for the assistance of you and your SKYWARN folks to mobilize and monitor the weather for us today. Although there were no "big" events from this afternoon's thunderstorms in northern Uintah County, your information helped us in several ways: Based on your reports, we learned that our radar was running "too hot" as it was indicating hail stones up to 1.25 inches in diameter, not only in Uintah County but also in Moffat County. Your information also indicated that the strong winds (i.e., greater than 50 mph) did not materialize. This information resulted in our forecast staff making the apparently correct decision to NOT issue any Severe Thunderstorm Warnings for northern Uintah County or Moffat County, even though our radar algorithms were telling us otherwise. Also, your reports confirmed that heavy rain was occurring from those storms over northern Uintah County, which essentially confirmed the radar rainfall precipitation estimates of a third to half an inch over any one spot from any individual storm cell. This morning, our forecast staff did discuss the possibility of drier air moving into northern Uintah County sooner than any thunderstorms could develop. Depending on the atmospheric computer model, thunderstorms could have been totally suppressed over northern Uintah County or they could develop and persist into the evening hours. That is why we were on the fence this morning when I spoke with you and Julie during the "standby" notification at 0900 MDT. Then after the thunderstorms initially developed before noon today, and when they persisted through the time that I requested the SKYWARN activation, it was decided in our office to err on the conservative side and assume the possibility that the storms could persist into the early evening hours in northern to central Uintah County. Well, hindsight is always 20-20, and the drier air moved into northwest Uintah County by 1600 MDT. As of 1700 MDT, that drier air already moved southward with the cool front into central Uintah County. Harrison said his group was grateful to have been of help: Erik Larsen, AD70V; Heather Larsen, AD7OW; Christopher Larsen, KF7JRE; Jonathan Larsen, KF7JRK; Dirk Checketts, KD7ZLG; Susan Checketts, KF7MWS; and Lamond Harrison, WX7L, who concluded "It was fun, wet, and deliciously cool on the mountain. The temperature dropped to 51 degrees while we were there. It felt good to provide a service that afternoon, and have a heck of a lot of fun also." Nominations are open for the 2012 ARRL International Humanitarian Award. This award is conferred upon an amateur or amateurs who demonstrate devotion to human welfare, peace and international understanding through Amateur Radio. The League established the annual prize to recognize those radio amateurs who have used ham radio to provide extraordinary service to others in times of crisis or disaster. As one of the few telecommunication services that allow people throughout the world from all walks of life to meet and talk with each other, Amateur Radio spreads goodwill across political boundaries. The ARRL International Humanitarian Award recognizes the Amateur Radio Service's unique role in international communication and the assistance amateurs regularly provide to people in need. Nominations should include a summary of the nominee's actions that qualify the individual (or individuals) for this award, plus verifying statements from at least two people having first-hand knowledge of the events warranting the nomination. These statements may be from an official of a group (for example, the American Red Cross, The Salvation Army, a local or state emergency management official) that benefited from the nominee's particular Amateur Radio contribution. Nominations should include the names and addresses of all references. A committee appointed by the League's President recommends the award recipient(s) to the ARRL Board, which makes the final decision. The committee is now accepting nominations from Amateur Radio, governmental or other organizations that have benefited from extraordinary service rendered by an Amateur Radio operator or group. Andrey Fedorov, KL1A/RW3AH, received the 2011 ARRL International Humanitarian Award. Fedorov is the former Chief Coordinator of the Russian Amateur Radio Emergency Service (RARES) and has been involved in providing communications support via Amateur Radio for almost 25 years. He has also served in Rwanda, Turkey and Kosovo as an Emergency Rescue Service Officer, and as a Regional Communications Officer for the UN Peacekeeping Mission in Afghanistan. All nominations and supporting materials for the 2012 ARRL International Humanitarian Award must be submitted in writing in English to ARRL International Humanitarian Award, 225 Main St, Newington, CT 06111 USA. Nomination submissions are due by December 31, 2012. In the event that no nominations are received, the committee may determine a recipient or decide to make no award. The recipient of the ARRL International Humanitarian Award receives an engraved plaque, as well as a profile in QST and other ARRL venues. I was taken by the letter from the National Weather Service's meteorologist to the EC of Uintah county, Utah, Lamond Harrison, WX7L. It provided an intimate glimpse into just how significant the NWS considers Amateur Radio's SKYWARN contributions are. I found it be fascinating and richly rewarding. Congratulations to Uintah county ARES.